Source: CICH graphic created using data from Statistics Canada, Table 102-4505 – Crude birth rate, age-specific and total fertility rates (live births), Canada, provinces and territories, annual (rate). http://www5.statcan.gc.ca/cansim/a26?lang=eng&retrLang=eng&id=1024505&&pattern=&stByVal=1&p1=1&p2=38&tabMode=dataTable&csid= -accessed March 17, 2017. 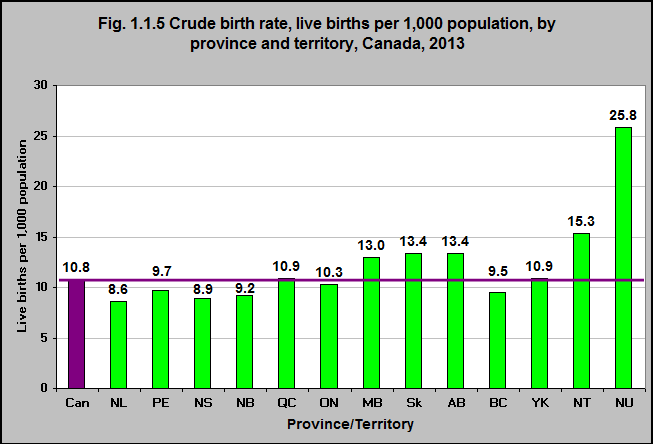 In 2013, the crude birth rates varied considerably between the provinces and territories. The crude birth rates in Newfoundland & Labrador and Nova Scotia are about 20% lower than the national rate at 8.6 and 8.9, while the rate in Nunavut is more than double at 25.8.